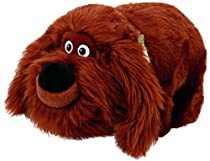 A Ty Beanie Baby Plush Collectible of Duke, the Mongrel from Universal Pictures film Secret Life of Pets. I like him but I thought that he was going to be a bit smaller ore the size of the other Ty beanie babies but I guess because he is so big in the movie he was made bigger. His fur is a bit unruly not as plush as it looks in the picture. We got this large size Duke to go with the smaller version of other pets from the movie. It was fun to have this one, because in the movie he is so much bigger than the rest. It is a high quality plush, very soft and cute.